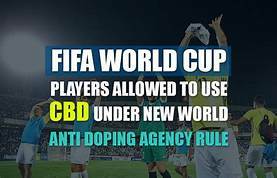 Under the worlds anti doping agencies ruling, CBD has now been OK’d to use by FIFA soccer players. It is kind of surprising that major world agencies are going to allow the use of CBD in major sports. For years these agencies have totally been against anything that could possibly enhance a players performance. Everything from steroids, to blood transfusions has been banned. Marijuana is also classified as an illegal drug, and any soccer player who tests positive for it at the World Cup would be banned. CBD is a completely different compound. CBD is potentially a natural solution for the professional athlete. There is an increasing body of evidence to show that CBD is anti-inflammatory, anti-spasmodic, and capable of alleviating and relieving pain. How often have you heard about players being injected with painkillers in order to complete a game? With CBD, there is no need to place the players in harm’s way. No more risk of getting addicted to opiods. CBD is the way of the future.